I believe this picture is circa 1972. Yes, Shirleen was the “pretty” one and I was the “cute” one. Therefore (in my literal child’s mind), she was beautiful and I was ugly. OH, THE BAGGAGE! My Mom STILL feels bad if we tease her about that one, because OF COURSE she didn’t mean it the way we interpreted it. Oh yes – and Janet somehow construed that she was ugly AND stupid. I don’t even know the origins of that. I suppose we could just go with the proverbial, “Girls, GIRLS – you were ALL pretty!” OR, we could just decide that we were ALL brainless and unattractive in order to be, perhaps, more egalitarian. If it were not Shirleen’s Birthday I would tell you all about the mischief with which she got away because of her that angelic countenance. She could be very mean and oh-so-sneaky (in a fairly innocuous child’s way) to me and then her innocent appearance usually got her off the hook. Do not – DO NOT – trust her beatific exterior. It belies the fact that she is actually Miss Sneaky MacSneakster! Wait – that was twenty to thirty years ago. Now she is by far one of the most generous and honorable people I know. Damn. Oh – imagine that – I DIGRESS. What I wanted to say (again), was HAPPY HAPPY BIRTHDAY, BIG SISTER! I especially like the last part because it reminds me (and you) that I’ll never, EVER be older than you. But in a nice way… I LOVE YOU! P.S. Dearest Lil’ Chris, A Hipy Papy Bthuthdth to you, too! Happy birthday Shirleen! Sorry for all miserable-sounding health woes Kate described; I hope they end promptly. My heavens, what a lovely photo of the three of you. why did I never know that there were any Bartolomitzkovitch’s aside from Kate and Janet? huh. I guess I’m ultra-lame. I don’t see how you can be ULTRA-LAME when I haven’t any idea how many siblings you have (I believe you have at least two sisters?). But FYI, I have two younger brothers as well. I have never seen such a perfect photo of such perfect and beautiful children! How did your mother do it? Gina, I apologize for the delay. My spam filter seems to very selectively decide what notifications I get about my blog. Oh – just so you don’t feel bad, anything and everything that I write automatically ends up in the spam folder. My spam folder either loves me, or the Universe is telling me to shut up. Either way, I would be more annoyed if I did not get a Spam recipe each and every time I go into the folder to retrieve my notifications. You are very sweet (I mean actually saying that my sisters and I were “perfect and beautiful”). My Mother is ofttimes a Saint, seriously, but even SHE would never say we were or are perfect. Beautiful, perhaps, though as a Mother she certainly is not objective. Appearances are so deceiving! Along those lines, I will say this: Those were the good old days when we could, even as children, display some sort of pretense that we were angelic and sweet. There are, however, candid shots which belie this “perfect” image and show us more honestly. 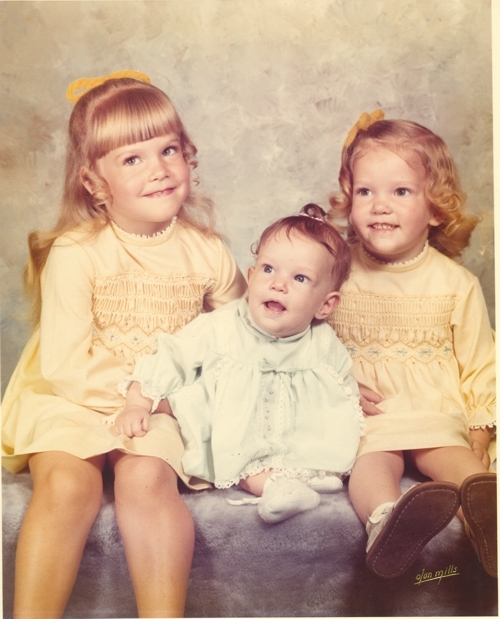 This happened more often the older we got, and by the time my Brothers were in the picture I’m not sure we ever appeared to be so innocent and lovely again. Oh – and you should read THE COOKIE INCIDENT. It took place during approximately the same era as the picture. That’s how perfect I was. And to this day, we have the smart child (me), the boring child, the creative child, and the athletic child. Of course, the “boring” child is the whip-smart one who can turn a phrase, tell a story, and provide entertainment for an entire evening. Boring child, my deflated buns!